For all the hype around mobile music creation, here’s a story with an ending in the opposite direction. Independent developer Olivier Gillet is the reason a lot of people see handheld gadgets as potential music making devices; he’s the creator of the brilliant Bhajis Loops for Palm. But, as if to prove that hardware can be a digital platform, too, his latest creation, while it will fit in your palm, isn’t for a device like the overcrowded iPhone. And as we take up the issue of platforms for sonic tech, Olivier’s timing is perfect. Amidst gloom and doom predictions of the sunset of tinkering, the tinkerers soldier on. Vintage analog filtering. This isn’t just about harsh digital sound, though. The filter is decidedly retro – the CEM3379 VCF/VCA, similar to what you’d find in a Prophet VS, Ensoniq ESQ-1 or Waldorf Microwave. That warms up the resulting sound. 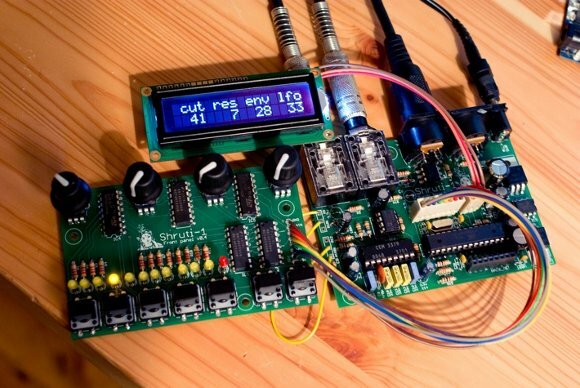 Make it yourself, open source: You can get on the list for a kit, but the full instructions and bill of materials are also on the site; check the maker/hacker section. And without getting into a tricky discussion of intellectual property and open source hardware, let’s put it this way – with Creative Commons specs and GPL3 firmware, I think the Shruti-1 is “good enough for jazz,” whatever your local lawyer may think. Small, light, portable, 9V-battery powered, and as mobile as the Palm app. MIDI support, so this is playable from a keyboard (strap one to an AX-09, perhaps) and sequence-able. It’s also notable that you don’t have to be a fan of chip music to love this design: it’s an electronic instrument suitable to a wide range of tastes, including chip lovers but other folks, as well. It’s not a perfect design for everything: I’d like to see a fully-integrated board, its future is somewhat limited by availability of that filter, and I’d prefer more physical controls to the few controls and reliance on the LCD. But it’s cheap, sounds fantastic, and looks like great fun. Put this alongside creations like the wonderful Ruin & Wesen devices, and we have a small, growing galaxy of open, open-ended, hackable music hardware that stands with or without a computer. That’s a subject for another article – nominees welcome. Kits are priced 115€ + shipping – with the convenience of not having to worry about sourcing parts yourself. The project is 100% open (and well-documented), so there’s already enough information on the site to allow someone to source the parts, get the PCBs manufactured, build and flash the firmware, and assemble it. I’ve decided to behave “responsibly” with the CEM3379s (http://mutable-instruments.net/node/91 ). While It could be possible for me to buy the last stocks from all the distributors that stock them, and to squeeze some other batches of kits, I am not doing it to leave room for the Ensoniq/Sequential repair/servicing market. deviating a bit from the original Shruti-1 sound. It’s terrific work. I could see a lot more like this. I’ll be curious what people do with them. Keep us posted – particularly if you get creative with the case, with musical uses, or other mods.